Carda Chase is the Strider of Chronos. But figuring out what that means may cost him his life. Struggling through high school in Phoenix, Arizona was hard enough, but now Carda’s hands are burning with magical fire and lightning. Worse, they affect time and space. Now all kinds of people want Carda dead, from a killer angel to the head of the extra-world Council. Fortunately he has allies—his twin sister Michelle manipulates gravity with dance. His rival Indal is secretly a time mage—until Carda accidentally turns him into a werewolf. There’s Ben, a black time-traveling lizard. And Xironi, a gorgeous catgirl with a growing crush on Carda. Together they face the most horrifying enemy of all—an inept mage with far too much power. This power unleashes a chaotic subspace storm that consumes worlds—and Earth is next on the menu. A new space opera epic begins! 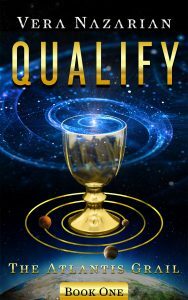 Cris was born with rare telekinetic gifts—abilities outlawed by the governing Priesthood. But, a new future awaits when Cris unexpectedly receives an invitation to join the Tararian Selective Service and begin their sanctioned telekinesis training program. Except, following that path puts him at the center of a generations-old galactic conspiracy.